Have you ever found yourself a little transfixed by that late day/early evening glowing skyline as it stretches across the horizon and envelopes everything below it, and to the sides of it, in a soft splash of gold? I certainly have, quite frequently; and it’s probably one of my favorite things in the world. And it can whisk me away into moody daydreams of moving pictures in my mind, punctuated by a new favorite song that plays on continuous loop as a soundtrack, adding to the sweet melancholia that swells my heart until it feels like it might just burst, but in a good way. Those mesmerizing early evening skies that we have here in Los Angeles are entities themselves—beings—like brooding characters out of a Hollywood film. They’re a touch smoky-purple and blue from that famous smog of ours (crazy enough, it makes for a spectacularly colored sunset), and they never hang around for anything more than about “15 minutes” or so, until they slink away. And so I try to grab a hold of them when I can, these evening skies that I call “mine”, these muses that sparkle and shimmer. Sometimes I imagine the golden-hued twilight sky having a flavor to it, a touch of spice, that permeates just a little into everything that its yellow light falls upon. I imagine that it has a succulence, a juiciness, and a vibrance—a brightness—that is accented by tiny bursts of coolness. And it is delectable for the soul, and a feast for the eyes; and I have the feeling it would taste wonderful on the tongue. There’s something about it that feeds and satiates, yet at the same time, leaves me longing for more. And so I wait for it to come again, tomorrow. The golden-hued evening sky that envelopes is like a warm wrap that holds me and everything else below it tightly together, all rolled up nice and snuggly, and keeps all that is good and true gently protected. It is a gift to the soul that yearns for things that are better and more divinely delicious, holding those very things suspended and in wait, until those who can resist no longer come and take a bite of it. Ingrid- you have done it again! These wraps are incredible! The chicken is sooo yummy- and moist!- even though half of them charred a bit much on the bbq! The Spicy Garlic Sauce is a new favorite for our house- I doubled the recipe to be sure we had enough to dip our fries in to also, and so glad I did! As this will be a great change-up to mayo and mustard for sandwiches! I followed your recipes exactly, and they are perfectly magnificent! Thank you for another wonderful addition to my recipe file and our family dinners! Have a lovely Easter weekend!! 🙂 Tip for readers: Can’t find Tahini in your grocery store? I found it in mine by accident as it is in the Kosher section!! Maybe your store would have it in the same place?! Hi Kathi! I’m thrilled that you and your family enjoyed these! Isn’t that sauce delicious? And thanks for the tip on the tahini; it looks like different stores keep it in different places. Thank you for your comments! How long will the sauce last in the fridge? Is there a tahini substitute? I want to make these tomorrow but don’t think I will have time to grab it. If it’s a game changer I’ll wait until I can get some. I take a hand full of sesame seeds, roast them and blitz them to make a paste. It does a bit of the flavour you are looking for. I made these tonight and they were so yummy! The marinade gave such great flavor to the chicken and that sauce…….omg so tasty! I like things spicy too, so i added more sriracha and cayenne as well. I served it with a simple salad and spelt risotto from trader joe’s for an easy side dish. This will make our rotation for sure! Thanks! Hi Michele! 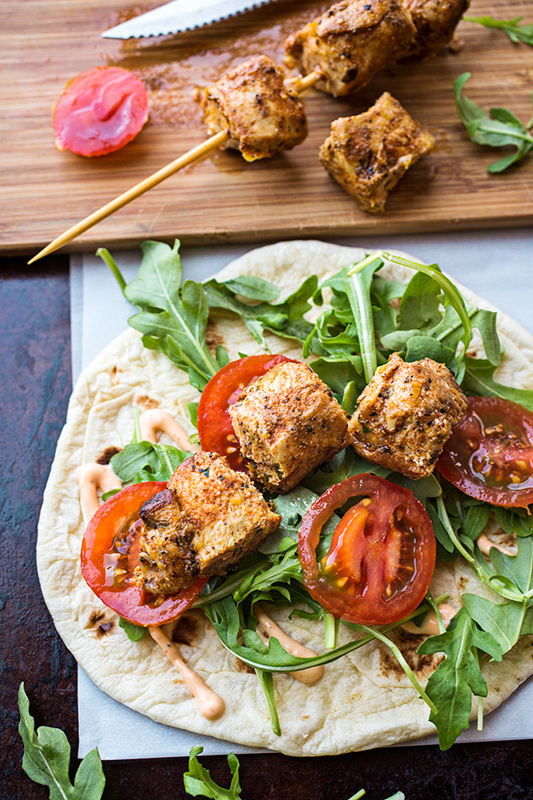 So excited that you enjoyed these, and that they’ll be a part of your dinner rotation! Great choice of side by the way—isn’t Trader Joe’s the best? 🙂 Thanks for your comments! I just now marinated my chicken and mixed up some of the sauce. Can’t wait to try these tonight for dinner. I also got some real Middle Eastern flat bread to try with it from a store near by. 🙂 Ty for the wonderful recipe! It looks delicious and healthy. Hi Shakhar, hope you enjoyed these! Thank you for commenting. Can’t wait to try these! Sounds so yummy & amazing! The sauce sounds tasty too! Thank you for the recipe! Hi LaTrice, absolutely! Use whatever type of green you and your sis will like! 🙂 Hope you both enjoy the recipe! I made these for dinner tonight. They were absolutely delicious! I’ll definitely be making them again. Thank you for sharing the recipe. Suzanne, my pleasure! So glad you enjoyed them! Can you tell me where to find Tahini. I have looked at 2 supermarkets and Walmart…I live in a major city in the U.S. but can’t seem to find it anywhere. I found Tahini at Whole Foods. Asian grocery stores often carry it. If you google it, you can often find at least one middle eastern grocery store in larger areas. Fresh pitas are here as well. Made this for lunch today. Awesome. Thank you so much. We cut back on the Sirachi, I’m not sure my kids would have eaten the full version. The chicken was delicious on its own and the sandwich combination was great. Will definitely make again. That sounds perfect! Glad the kiddos liked it, too—thank you for your comments! I can’t handle a lot of spice but this recipe sounds so good. How can I substitute for something less spicy? Such a good recipe! 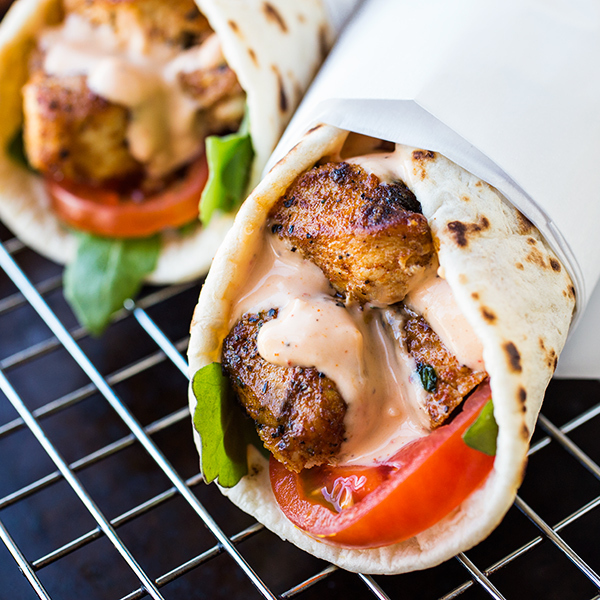 My family loves this shawarma style wrap and it’s now part of our weekly dinner rotation! Thankyou! Glad you’re enjoying, Shilpa! Thanks for sharing with me! and the spicy garlic sauce . To salty for my family . Megan, so glad you and your family enjoyed these! And yes, absolutely—use the amount of salt that you and your family are comfortable with. Thanks for commenting! Oh My Gosh!!! These are the most amazing things I have eaten in a long, long time! Thank you so much for this recipe! The only thing I added was cucumber and feta. I was looking for something healthy and different. This is on my list now. Love it! Hi Abbie, the cucumber and feta additions sound perfect! So glad you enjoyed these, and that they made your “list”! 🙂 Thanks for commenting. This recipe is a huge hit with my family! Everyone asked for this recipe to be regular on our menu. Thank you for sharing it! Hi. I made these for dinner tonight. I have a ton of the sauce leftover. How long will it keep in fridge? Hi Rebecca, it’ll keep for a while in the fridge—I’d say you’d be fine for about a week (maybe even a little more) as long as it’s kept in a covered, air-tight container and cold. You can enjoy it as a spread, or as a dressing, as well! Glad you enjoyed these. 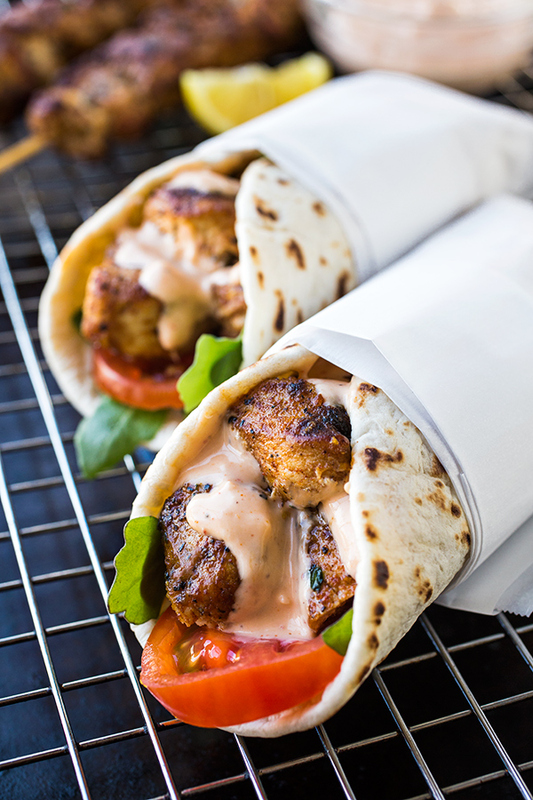 These wraps are TO DIE for! Omg my husband and I AND my 15 yo son loved every bite! My son is the pickiest! I thought for sure he would pass on the sauce. But he loved it! We are having them again tonight! Two days in a row. Love love love! Hi Timmi, that’s so great! Thanks so much for sharing that with me. 🙂 Glad you all enjoyed, and I particularly love that your “picky” 15 year-old enjoyed, too! Made this tonite. Flavor was excellent! Added cilantro to it. Even better.! Sauce was great with the spices on the chicken. Pretty spicy so if you like spicy even better. Dave, the cilantro add-in is a great idea—I love cilantro, too! Thank you for sharing your experience with the recipe—glad your enjoyed! This recipe sounds delicious! By any chance do you have the nutritional information on this meal? I cannot find Tahini anywhere. Living on a military base in Japan you can’t find much of what you want when you need it. Can I do without the tahini or is there anything I can replace it with? Also can I use minced garlic in the jar for the sauce? Hi Ana, first, of all, thank you for either your service, or your loved one’s service! Our son is a Marine, and it makes me feel kindred to hear that you are on a base. 🙂 Don’t worry about including the tahini—can totally be left out. And use the minced garlic if that’s what you have available—fresh is best tasting, but if you’re not able to get it, use what you have. Hope you enjoy! Made this tonight and it was so awesome. Thank you so much!!! Chelsea, so glad you enjoyed! GREAT recipe!! For anyone who is wondering, you can leave out the mayonnaise from the sauce and it’s still super delicious! (just replace with a little more yogurt/sour cream). I also didn’t use the tahini as I didn’t have any. Personally, I found that it made about double the sauce you need. There were so many great flavors in here you could really just eat the marinaded chicken on its own (the sauce almost overwhelmed it a little), but it was a really delicious combo. Andrea, thanks so much for your comments! 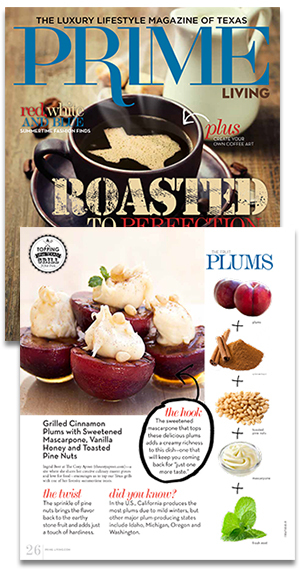 Great that you made the recipe to your taste! AWE SNAP! This is a recipe for the ages. Made it for Father’s Day and it was a huge hit. Our daughter now wants it for her B-Day dinner. This is even good the following day as leftovers. Well done Cozy Apron! Hey Adam, that’s awesome! So glad these were a hit for you, and I”m thrilled your daughter already requested the recipe as her b-day meal! 🙂 Thank you for your comments. Cristina, isn’t Pinterest the best, lol?! So glad you all loved this, and I’m grateful you came back to share your experience with the recipe. Great way to make use of the remaining arugula, by the way! I have made this a few times but always go back to the garlic sauce. It is a staple in my kitchen. I leave out the salt and cayenne pepper for us -just due to individual tastes. It is SO delicious!! Thank you!! Hi Denise, thank you for sharing that with me! I’m thrilled you’re enjoying the sauce so much—it’s truly really tasty on all sorts of things, isn’t it? I appreciate your comments. these look sooo good! Love that sauce! Buzzfeed featured your recipe recently and I just made it – and I’m in love! I skipped the tahini in the sauce and the coriander on the chicken, as I’m not a big fan of both, but still it was amazingly tasty. I just mailed this to my mom, as I know she will love it just as much. Thank you for this wonderful inspiration! Hi Alexandra, thank you! Glad you enjoyed this, and that you passed it along to your mom, too! 🙂 Appreciate your comments. Just made this and it is OUTSTANDING!!!! Those flavors blended together!!!!! Words fail me. I don’t have enough superlatives. Thank you and kudos. I have made these wraps several times now and it is a regular in our family as they are absolutely delicious.! Last time I made them I forgot to put the tahini in the sauce but was still was great! So I guess if you don’t have any or can’t find tahini near you then no worries! Thank you for such a great recipe! This was amazing! I used a different marinade that had more garlic, 1 tsp paprika, no coriander or oregano, added a pinch of cinnamon and nutmeg. I don’t buy tahini because I never end up using all of it so I just put some hummus on our wraps. Omg the garlic sauce is to die for, we even dipped tater tots in it! Thanks for this amazing recipe, I would make it again and again. HI Crissy, glad you enjoyed! Thank you for sharing your experience. Made this for tea tonight, And omgoodness they where amazing and loved by young and old in my household. A new family number one. I cooked chicken on the BBQ, wonderful and easy for summer. Kimberly, I love the idea of dipping fresh veggies into it—perfect! So glad you both enjoyed the recipe! Do you know what the serving size/calories would be for just the sauce? The serving size for the sauce is about 4 tablespoons (1/4 cup), approximately* 70 calories. *But the calories will for sure vary depending on the brands/kinds used for the ingredients. Making lemon chicken tonight, can’t wait. You can make tahini with sesame seeds and olive oil. Look on Pinterest and get the recipe. Seems very easy. I made this last night, it was the best thing I have made in a while. I didn’t have tahini so I used 1 tsp of sesame oil. It worked out well. I just found your blog and I love it. The photos are like beautiful artwork and the stories with each recipe are so well written and many of them so inspiring and uplifting. Thank you. Wow, Angela, I’m so touched to read that, because you say it’s the best thing you made in a while (love that), and because you mentioned the written posts and my husbands lovely photography. Thank you! We strive to create a site that will nourish both the physical and the spiritual, so that means a lot. We appreciate your comments! Hello this looks great, but I am allergic to chicken. Do you think that you could substitute steak instead? Hi Samantha, absolutely! I think steak would be excellent! Hi, I used only 1/2 teaspoon of iodized salt and found it a bit too much. So then I wondered if you were using kosher salt? And I’m a saltaholic…..lol. This was so delicious and the sauce is amazing! Looking forward to trying other recipes, I just discovered your site. Maureen, that is wonderful! Thanks for letting me know that you enjoyed your experience with the recipe; and I’m very excited that you’re planning on giving other recipes a go, as well! Happy cooking! Of Course, Becca! Just cook up chunks like pictured above, in a skillet or however would be easiest. OMG. I made this recipe this weekend. It was a HIT! My family is already asking when I will be making this again. Leftovers were just as tasty the next day. So flavorful. I used Lavash bread as my “wrap”. Thank you for sharing this recipe. I am a fan of yours for life!! Donna, wow—so happy to read that! (I particularly love it when the whole family enjoys a recipe.) So excited to have you as a “fan for life”, lol, and I truly hope you give some of our other recipes a try as well! Thanks so much for taking the time to comment. I usually like when people make comments once they have tried the recipe but in this case just had to comment on the photographs. They are amazing. Thanks, Claire! I appreciate that! I made this tonight, and my husband and son both loved it! I’m excited to try more of your recipes. Hi Hannah, that’s great to hear! Glad you all enjoyed the recipe, and it’s also music to my ears that you plan on trying out some other recipes, as well. Happy cooking! I’ve been eyeing this recipe for so long, finally getting to it (chicken is marinatin as we speak) but, I don’t have a grill #DormLife. Can I still get the same awesomeness in the oven or non-stick frying pan? Hi Des, I’d go with the fry pan, and just cut the chicken up into chunks. I hope you enjoy this! Glad you’re finally making this! 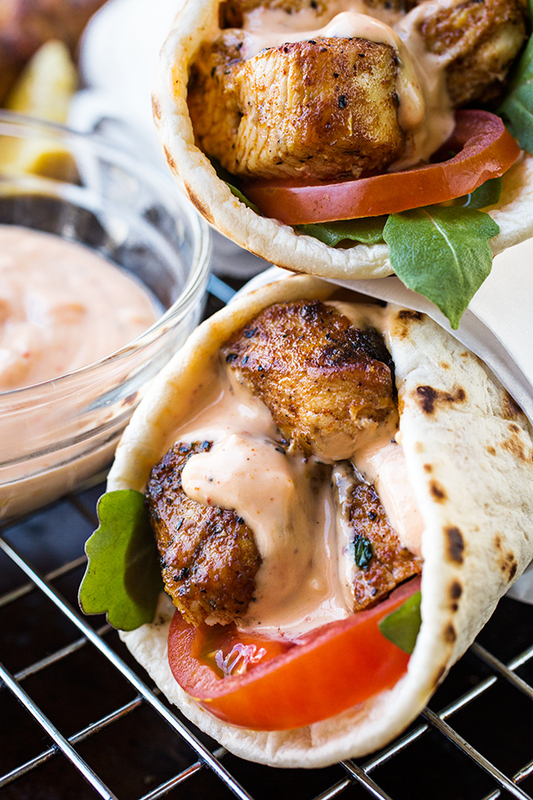 Your garlic sauce is amaze-balls! I have made this recipe twice! We love it!!! Thank you for this yummy meal! Hi Michelle, I love that! So glad, and thank you for sharing your experience! Just letting you know that we’ve made this recipe about 10 times in the past few months. A favorite, for sure! Thanks! Hi Neha, I’m thrilled you all love the recipe! Thanks so much for your comments! Caroline at Pinch Me, I'm Eating! Loved this!!! I sliced up the chicken instead of chunking it, and also tossed some eggplants and red bell peppers in the marinade. Served with tomatoes on homemade pita bread. Definitely a keeper! Glad you enjoyed, and put your own spin on it! Good recipe! 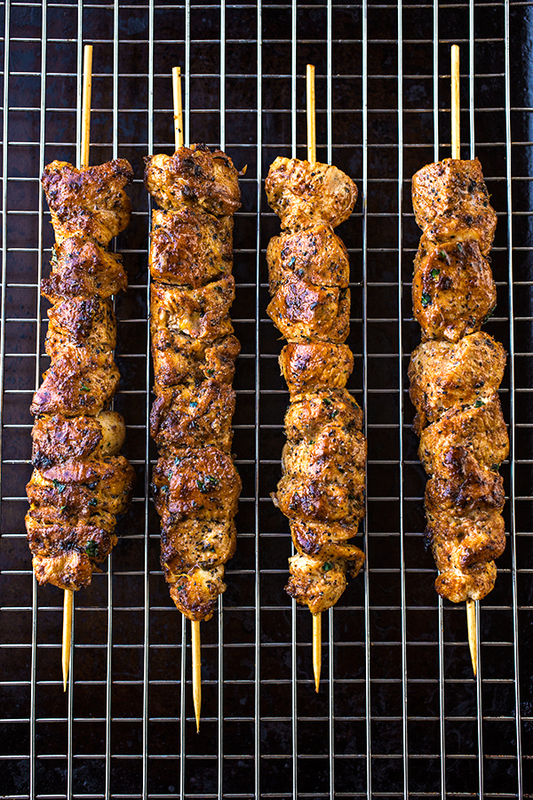 My family enjoyed it, and thought the use of skewer made the chicken a very special weeknight meal. I broiled them in a foil lined baking sheet for 5 minutes each side. Sauce was very good! I did not need to use all the salt. Hi Ros, thanks for your comments! Glad you enjoyed these, and that you tweaked the level of salt to suit your needs. They’re so many comments, but I have to. This is amazingly good. Thank you. It’s a cold winter’s night in Seattle and this was perfect. Hi Jeff, there can never be too many comments, lol! I’m thrilled you enjoyed the recipe & found some comfort in it on a cold winter’s night. Thank you for sharing! Thank you so much, this was AMAZING!! My husband and I loved it!! So Many Flavors but worked So Amazing Together..we found online to use peanut butter As a substitute for tahini. odd but it worked..
Wow, Barb, that peanut butter is certainly a unique twist! I’m just so very happy you enjoyed it, and thank you for taking some time to share your experience! Okay… can I just say how delicious this is? My husband and I are not eating carbs so I made this on a bed of patricianly cooked spinach. The flavors are outstanding. I do however think next time I won’t use as much garlic. Don’t get me wrong, I L O V E garlic but for some reason it was a little overpowering. I also used a bell pepper when BBQ ing it. If I could rate this I would give it 5 stars!! Hi Brinkley, thanks so much for your 5-star rating! What a creative way to serve these for your no carb diet…I’m sure the spinach was delicious, as well as the bell pepper. And if that garlic is a bit too overpowering for your taste, absolutely go less on that to make this more enjoyable for you. Thanks so much for your comments! Amazing!! The flavors were out of this world . My son is not huge into tomatoes so I sautéed onions & mushrooms which were great addition! Thx for the great recipe! Hi Carol, great substitutions! I’m so happy you all enjoyed the recipe so much, and I thank you for taking the time to share your experience here, as well! Hello! I want to make this for dinner tonight, but was wondering if I could pan fry instead of grill the chicken? Thank you for your help. Hi Stephanie, of course! Please use whatever method works best for you…the flavor will still be as delicious as ever. Hope you enjoy! I made this tonight for dinner, the kids and husband devoured it- myself included! My husband kept commenting on how good dinner was – something I don’t achieve often, ha! I didn’t have tahini for the sauce or coriander for the chicken and I fried it in a very hot pan. Thank you for sharing your wonderful recipes for everyone to enjoy! These look amazing! Do you by any chance know how many calories per serving? Hi Alana, I just did a quick little calculation, and the calorie count per serving is 747. Hope that help! Enjoy! Just made this for dinner tonight. SO YUMMY! Even my pickiest eater liked it minus the arugula. I did add a little goat cheese just for fun. Wow that was good. I am not real big on sauces or dressing and honestly was a little nervous about putting too much on, but this one was so great I had to go back and add more. It just takes this very easy to make meal over the top. Thanks for sharing. 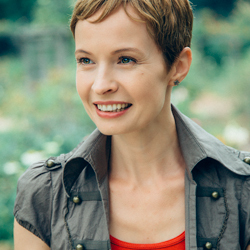 Hey Susan, I love when the “picky eaters” enjoy my recipes as well! 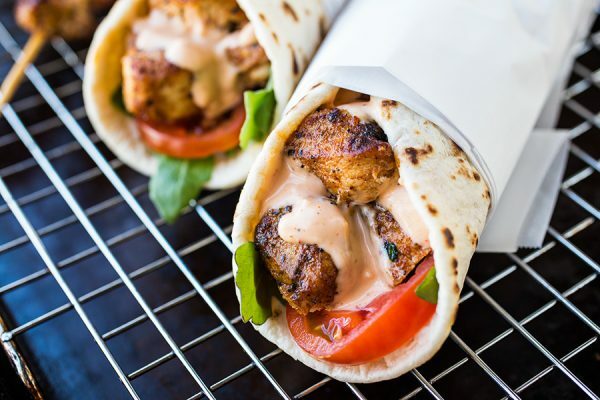 So glad the recipe was a success for you, and that you even ended up adding more of the sauce—it truly does take these wraps over the top with that extra hint of garlicky savoriness. Thanks so much for taking a few moments to comment on your experience! This sounds wonderful, which is one reason I spent so much time tracking the recipe down. I have a love/hate relationship with Pinterest. Mostly hate these days, as so many of the links I follow go nowhere, or have no source offered. I took quite a train of pictures to find your blog, and this recipe, and I’m glad I finally did. Hi Carole, I’m so sorry to read that tracking this recipe down was such a struggle! But I’m glad you ultimately found success in landing here, and that you will enjoy the recipe. Happy cooking to you! Great recipe! How can I get nutrition information? Hi Toni, thanks so much—glad you enjoyed! The calorie count per wrap is 747. My husband and I LOVE this recipe! We’ve made it so many times in the last couple of months! 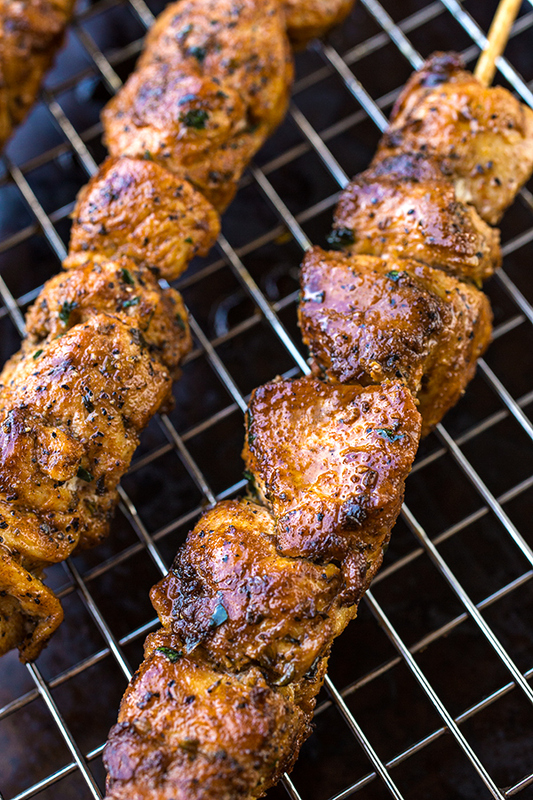 The Marinade is way out of this world! Hi Rachel, thanks so much! So glad you and your hubby are enjoying these wraps so much! Thanks for sharing your experience with me. Hi! This recipe sounds amazing! For the marinade is it possible to leave out the yogurt? I have a dairy allergy. Hi Nicky, you absolutely can leave out the sour cream or yogurt in the sauce; just sub in more mayo in that case. Hope you enjoy! This was easy to put together and the flavors were amazing!! I absolutely loved every bite! Hi Kelly, that’s great! I’m so happy you enjoyed the flavors in the recipe, and that you found it quite easy to whip up! Thanks for this great recipe. I think I found it soon after you shared it. I haven’t made it in a while, but my 27 year old daughter is home this weekend and requested it. Donna, I am so very touched that this recipe has been requested by your daughter. I hope you both enjoy it thoroughly, together! They say you eat with your eyes and the beautiful pics of your wraps made me want to try your recipe. Also that it was so easy to put together. I like kabobs but chose not to do it that way, I have a cast iron skillet that I put the chicken cubes in, same result. Also on the tahini, I looked up the substitute for it and it is 3 parts peanut butter to 1 part sesame oil which is what I used. Love the sauce and will be using it for other things. One thing that I added to the wraps was Feta cheese, just seemed to need it. My husband and I love these and this will be a keeper recipe. Hi Diane, thank you so much for sharing how much you enjoyed the wraps! Glad you made these your own, using a method that works best for you, and that all turned out delicious. And the feta is an excellent addition—it’s one of my favorite cheeses, and I can totally see how the tangy/salty flavors add a little extra flair! May you enjoy the recipe for a long time! This was SO GOOD! My daughter said I should use this marinade for chicken every time. Thank you for the delicious recipe we’ll be sure to make again soon. Anne, my heart is happy to read that! Thanks so much for sharing with me. Amazing. 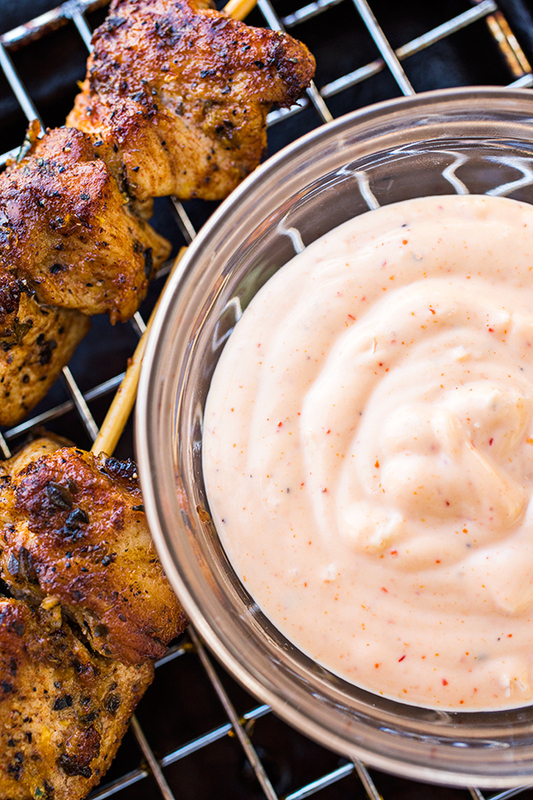 The chicken marinade is amazing and so is the sauce. Kristin, thank you so much! I’m thrilled you enjoyed the recipe so much, and I’m so very glad you came back to share your experience!